In the earlier pAsuram, AzhwAr said that only emperumAn is the entity to be held on to. In this pAsuram, he says that bhakthi (devotion) is the path through which he is to be attained. sevi vAy … – AzhwAr lists the lowest level of entities for those who follow bhakthiyOgam (devotion as a means of attaining emperumAn). prakruthi (primordial matter) is at the lowest level to be known. jIvAthmA is at a higher level, to be known. emperumAn is at the highest level and is to be attained. AzhwAr has first listed the five sensory organs viz. ear, mouth, eye, nose and skin. Mentioning these five implies the five organs of action (speech, hands, legs and the excretory organs) for carrying out tasks. sendhI puvi kAl nIr viN bUtham aindhum – this refers to the five elements of fire, earth, wind, water and ether and by implication, their subtle elements of form, smell, feel, taste and sound respectively. Thus the five sensory organs, the five organs of action, the five elements and the five subtle elements, totalling twenty entities are mentioned. Taken together with prakruthi (primordial matter), mahAn (the derivative of prakruthi), ahankAram (ego) and manas (mind), these twenty four would together make up the body. Hence we must take it that AzhwAr is talking about the physical body here. aviyAdha gyAnamum – the unquenchable knowledge. This term refers to bhakthi (devotion), which like a stream of oil, flows uniformly without any distraction. In vEdhArtha sangraham it is said “bhakthiScha gyAna viSEsha: eva” (bhakthi is a type of gyAna only). Hence gyAna here refers to bhakthi. vELviyum – deeds like carrying out yagya (rites) for development of bhakthi and for overcoming sins, without focussing on the end result. brahma sUthram 4-1-16 says “agnihOthrAdhi thu thath kAryAyaiva thath dharSanAth” (deeds such as agnihOthram (a type of ritual with agni, fire) are to be carried out for the development of bhakthi, since it is seen this way in vEdham). brahma sUthram 41-12 says “AprayaNAth thathrApi hi dhrushtam” (one should observe such deeds till the end of one’s life. Such rules are seen at all times). bruhadhAraNyaka upanishath 6-4-22 says “thamEtham vEdhAnuvachanEna brAhmaNA vividhishanthi yagyEna dhAnEna thapasA anASakEna ” (the brahmagyAnis (those who know about emperumAn) like to know about the supreme entity through practicing of vEdha, yagya, dhAna (charity), thapas (penance) without desire in the end result). From all these it is to be known that deeds, which are carried out for creation of bhakthi and for its development, are the path to attain emperumAn. nallaRamum – ability to distinguish between good and bad, as well as qualities such as compassion, charity etc are referred to by this word. enbarE – these are famously mentioned in SAsthrams such as vEdham (sacred texts). EnamAy ninRArkku iyalvu – all the above mentioned are considered as paths to attain emperumAn who is simplicity personified and who helps those who are in danger. Even if these are the means, it is emperumAn who gives the result [purushArthtam] as is brought about by the usage of the term “EnamAy ninRAr” (one who stood as a boar). emperumAn himself has said in SrI bhagavath gIthA 12-6 and 12-7 “yE thu sarvANi karmANi mayi sanyasya mathparA: | ananyEnaiva yOgEna mAm upAsithE || thEshAm aham samudhdhArthA mruthyu samsAra sAgarAth | bhavAmi nachirAth pArtha mayyAvESith chEthasAm ||” (arjuna! I lift from the ocean of samsAra (materialistic realm) which takes people towards destruction, those who submit all their karmas (deeds or activities) to me and who consider me as the end result, without looking for any other result [such as wealth, kaivalyam (soul enjoying itself) etc] through the path of meditation, worship etc, with total dedication). sevi vAy …. – AzhwAr mentions about the five sensory organs which wade into matters other than emperumAn, the five elements which are the causative factors for the sense organs, (the physical) body which was created by these five elements, the knowledge which is focussed on other matters (than on emperumAn) and says, when no one sought him at the time of danger, emperumAn himself came as a huge boar to save the earth from deluge. Finally he condemns them saying, would these (the sensory organs, elements, body, knowledge etc) be the sAdhanam (means) for attaining emperumAn? 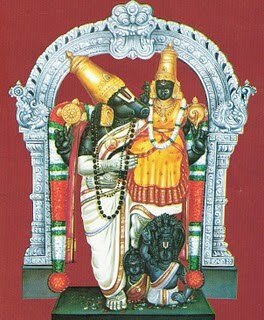 nammAzhwAr too, in his thiruviruththam 99 says “gyAnappirAnai allAl illai nAn kaNda nalladhuvE” (there is no means other than knowledge personified varAha [boar] among all the means). During deluge, no one prayed to him; yet he came and saved all. Hence he is the means to be considered. We shall next consider 13th pAsuram. This entry was posted in Other on June 21, 2017 by T N Krishnan.